Joel is an acknowledged pioneer in the development of interactive performance systems, and has been active worldwide since 1969 as a composer and performer. Needless to say, between being a techie and an artiste there's lots more to his music than may be immediately apparent to some. When people ask me what I do as a composer, I explain that I do not compose pieces, I compose activities. A 'piece', whatever its content, is a construction with beginning and end that exists independent of its listeners and within its own boundaries of time. The higher the art of a piece, the greater its abstraction and its intellectual qualities; and the more distant and aloof it is from life. An 'activity', on the other hand, unfolds because of the way people perform; and consequently, an activity happens in the time of living; and art comes closer to life. I then ask: How does art function in life? To be a little more specific in musical performances, I could rephrase that question to ask: How does art function in the life of the performer that is participating in one of my musical activities? Well, for one thing, I view the performer as a human being and friend, and not as the executer of a construction; and so I try to design a role for the performer that is challenging, creative, and comfortable. By challenging, I mean that I try to put the performer in a situation where the demands on the performer's listening and reacting skills are not routine. By creative, I mean that the performer has to come up with personal content, as against, as in a more traditional role, executing the notes in a musical score. By comfortable, I ask the performer to participate in a way that the performer finds agreeable, both physically and musically. The musical 'instrument' I use is a technological system, the functioning of which I design in software. It is the software that articulates the interface between instrument and performer, determines how the instrument will react to a performer's actions, and generate the sounds. The activity that I design, then, is defined by the interface, the way the instrument responds to a performer, and the nature of the sounds. In short, as against a musical score that is played on an instrument, in my music it is the instrument itself that is the work of art. The instrument is inseparable from the music it produces. As Yeats wrote, "How can we know the dancer from the dance?" Here's a case in point from some recent work. I composed 'Many Times ...', where the elipsis is the name of the performer, for a concert of my music at Engine 27, a sound gallery / performance space in New York City, in the spring of 2001. The underlying idea of the use of technology is that technology expands our capabilities. In 'Many Times ...', the instrument takes the sound produced by a performer and from it produces many different transformed instances of it throughout the performance space, multiplying the performer's actions so that it comes from loudspeakers on the left, on the right, above, behind, from here, there, everywhere. Those transformations, generated by the software that animates the instrument, are essentially unpredictable. Because of their unpredictability, they provide the performer with something to react to. In other words, the performer is influencing the electronic system by performing, vocally or by playing an acoustic instrument, and the electronic system is influencing the performer by giving the performer something to react to. This is what I call 'interactive performance', where the word interactive means 'mutually influential'. I find it a wonderful way to make music. It brings out the best in everyone. And considering that anyone can play the role of performer, it could bring out the best in anyone. Joel has appeared with Jan Williams and other musicians at venues and festivals throughout the world, among them Engine 27 (New York City), Music Festival of the Hamptons, Centro Cultural Recoleta (Buenos Aires), North American New Music Festival, Venice Biennale, Wellington Festival (New Zealand), La Porte Suisse (Paris), Aarhus Festival (Denmark), De Isbreker (Amsterdam), New Music America, Inventionen (Berlin), Tage Neuer Musik (Bonn), Ars Electronica (Linz, Austria), Electronic Music Festival (Stockholm), Experimental Intermedia Foundation, and New Music New York. 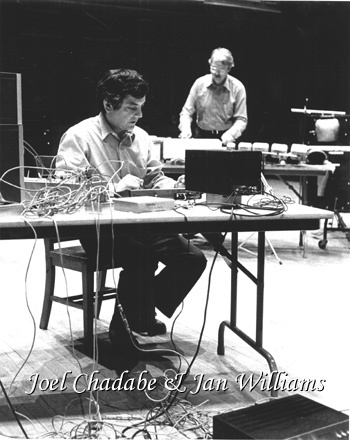 His book Electric Sound (Prentice Hall, 1996) is the first comprehensive overview of electronic music. 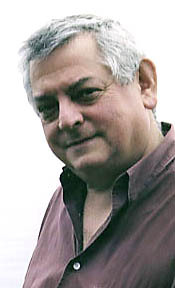 His articles have appeared in Computer Music Journal, Leonardo, Organized Sound, Electronic Musician, and numerous other journals, magazines, and anthologies. His music is available on Deep Listening, CDCM, Lovely Music, and other labels. As president of Intelligent Music (1983 - 1994), he was responsible for the development and publication of a wide range of innovative software, including M and Max. 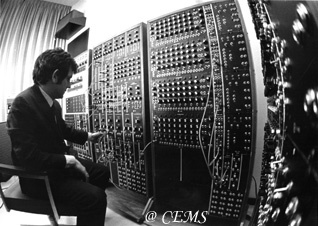 In 1967, as director of the Electronic Music Studio at State University of New York at Albany (1965 - 1998), he designed the CEMS (Coordinated Electronic Music Studio) System, an analog-programmable electronic music system built by Robert Moog. 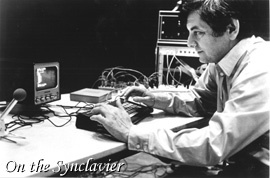 In 1977, with Roger Meyers, he co-authored the Play Program, the first software sequencer. He has received awards from the National Endowment for the Arts, New York State Council on the Arts, Ford Foundation, New York Foundation for the Arts, Rockefeller Foundation, Fulbright Commission, State University of New York Research Foundation, and other funding organizations. He has been keynote speaker at the International Music and Technology Conference (University of Melbourne, Australia, 1981), at the Association for Technology in Music Instruction Conference (Puerto Rico, 1998), and the International Computer Music Conference (Berlin, 2000). 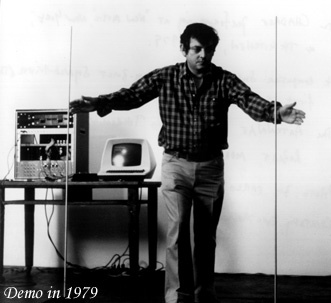 He was the winner of the Grossen Preises der Ars Electronica, 2nd Prize (Linz, Austria, 1982). He is listed in Who's Who in American Music, International Who's Who of Musicians, and Grove's Dictionary of Musicians. Mr. Chadabe was educated at the University of North Carolina at Chapel Hill (B.A., 1959) and Yale University (M.M., 1962), where he studied composition with Elliott Carter. He is currently Professor Emeritus at State University of New York at Albany, Director of the Electronic Music Studio at Bennington College, Director of the Electronic Music Studio at Manhattan College of Music, and founder and President of Electronic Music Foundation.